An in-depth interview with Saul David Raye. 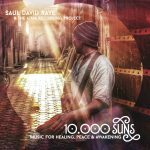 They dive into the heart of yoga, celebrate Saul’s new album, 10,000 Suns…Music for Healing, Peace & Awakening. In addition, Saul shares his wisdom as one of the wisdom keepers of Yoga in the West and East. He shares how the fullness of life leads us to the sacredness in all that is and we have the opportunity to dance with this energy in life. Finally, if you want to explore these concepts further simply press play above or below.